When ever I hear the name 47 Industries I think of quality welds, top notch fabrication, fair prices, laughter and Mike's thick Jersey accent. On a recent trip to NYC I maybe a point of visiting a few east coast friends along the way and Mike at 47 Industries was on the short list. As much as I like to bro down at Grassroots events it’s always a different vibe when someone invites you into their shop, home, and personality. Personality is one thing that there is no shortage of with Mike Palazzo, he's ready to debate just about any subject from either side depending on your take and he consistently keeps me laughing when ever we get the chance to hang out. I had always wondered where the name 47 Industries came from and knew I would not be disappointed by the story when I finally asked. See Mike was a company man before... working for a Cadillac dealer for 15 years or so and 47 was his employee number. Mike would write a 47 with a sharpie on this inside of engine covers that he had worked on or things that he had fixed so when the next guy opened it up they would see he had been in there. This some how seemed to offend some manager types. This of course led to many more 47 tags proliferating and his nic name Mike 47. The running joke eventually turned into a 47 Industries t-shirt that he wore to work one day. Management was not impressed and though Mike had talked for years about opening a shop the fact that he was told he would never make it on his own prompted him to tell them to take them the job an shove it. 47 Industries was born and Mike took the leap from working in his home garage to moving into a large industrial style facility. If you like to geek out on Bridgeports and metal working equipment of every shape and size 47 Industries is a trip. I love shining a light on guys that have taken the difficult step of leaving the security of a union job to do what they love. It's guys like Mike that act as the support system for so many builders that can't do it all on there own or lack the skills and equipment. Mike's been a very active member here on CC as well and a great supporter of many grassroots runs. 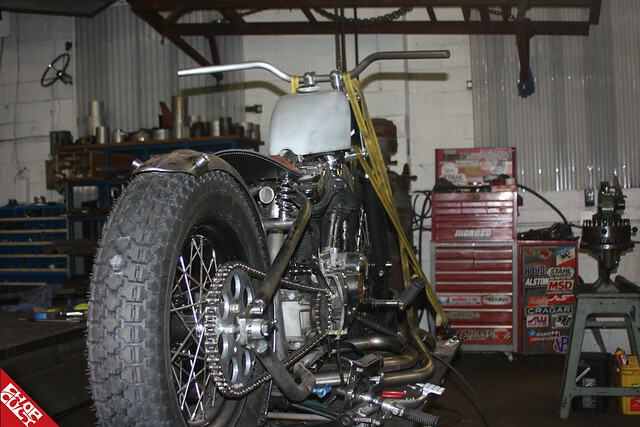 If you need a full hot rod build or a custom hard tail 47 Industries can handle the job with style and probably a few laughs. Mike also does one of the coolest events of the year... "The Unfinished Bike show" this event really showcases the talents of fabricators. As Mike likes to say "are you man enough to show your bike before the bondo and paint goes on?" I think it's a great event and gesture to pay respect to the fabricators of the world that are often over shadowed by painters and dudes that bolt stuff together and say they built it. the timer cover is rad!!! Mike rules! Glad he is getting some space in the spotlight, every bit is well deserved. Thanks for the good words guys. Thanks to Bear and the CC crew for wasting some cyber-ink on us. It's much appreciated. Mike did my hard tail...top notch guy and quality work. well deserved! Awesome guy and a professional to boot. Thanks for your help and support Mike. One of the best men out there. Period. Is that a Bush's baked beans timing cover? 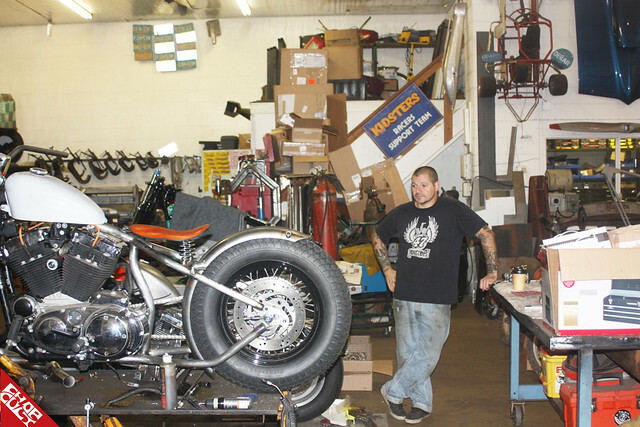 Mike runs a top notch fabrication shop and he is a total stand up guy. Im glad to say that I can call him a friend. Great write up. Mike is truly a stand up guy and is always one of the first people I name when recommending to someone looking for fab work.